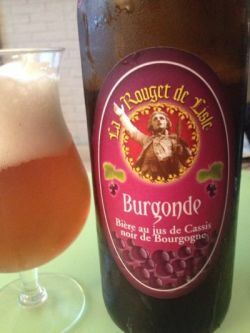 Beer made with Bourgogne blackcurrant juice. bottle from hyperboissons Dijon. Golden colour, white head. Fruity nose. Medium-bodied. Malty start, some furity hints, some cassis. Bue en bouteille de 75cl. Ensemble mauvais, arômes de fruits très discrets et mal faits. Pas très agréable à boire. bottle. cloudy orangered, smooth white head. mild fruity (lemonade) aroma, faint hay, faint fruity sweetness. faint fruity tartness. flavor is fruity bitter, lemonade, hoppy bitter. pretty strange. It’s like the fruit has been thinned by water, but then the ABV is quite high. end result pretty weird. Bouteille de 33 cl achetée chez Bières et Cie à Lons-le-Saunier (F). Bière cuivrée-rousse à reflets vieux rose, mousse blanche fugace sur maigre pétillement. Nez fruité de baies, acidulité. Parfumée au cassis, la douceur maltée ne sert que de support. Acidulité fruitée, corps mince, pas le longueur en bouche, seulement rafraîchissante et plus sèche. Bottled, brought by a friend. Murky reddish color, short frothy head. Aroma of berries, slight hoppy, bit malty, bit yeasty. Fruity taste, not too sweet which is practically the only good thing, but too yeasty. Mwah. Bottle 75cl. @ [ Tasting by Maria ]. The color is a reddish peach and the head is OK. The aroma has sweetness and notes of fruit and berries. The flavour has sweetness and a light berry sourness and notes of berries, but I do not catch a clear note of black currant. It’s a bit on the thin side.